In the foreground of this picture of the town of North Sydney, Nova Scotia in Canada you will find the terminal where the Marine Atlantic Ferry docks. 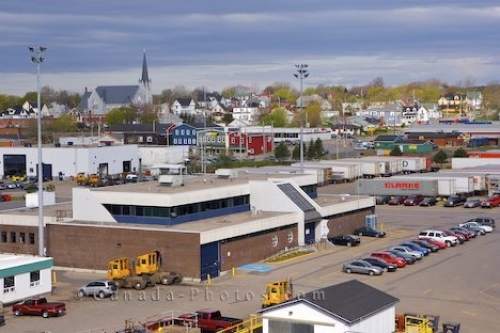 The Marine Atlantic Ferry Terminal of North Sydney, Nova Scotia is shown in the foreground of this picture with the other unique maritime buildings in the background. North Sydney has become a very important town in the Maritimes where travel has been made easier and is now a town of approximately 7,000 people. Town of North Sydney with the Marine Atlantic Ferry Terminal in the foreground, Nova Scotia, Atlantic Canada, Canada. Picture of the ferry terminal and buildings in the town of North Sydney in Nova Scotia, Canada.